Flaunt your style in colour Step up your fashion impression with BLINCON BB cosmetic co.. Discover the wonder of colors with COLORPIA AMAZING cosmetic contact lenses. The range of delicat.. Unveil the Mystery within. Reveal your inner mysterious with BLINCON PEARL cosmetic contact lense.. PROMOTION PRICE!! 4 Boxes for RM 280 ** save additional RM20 8 Boxes for RM 520 ** save RM80 ++..
*** PROMOTION : BUY 4 BOXES FOR RM140 *** Modern Sophistication, Natural Charm The natural loo.. PROMOTION PRICE!! 2 Boxes for RM 176.40 ** save additional RM13.60 4 Boxes for RM 345.60 ** save a.. PROMOTION PRICE!! 2 Boxes for RM 182.00 ** save additional RM8.00 4 Boxes for RM 356.00 ** save ad..
"Goods" means goods but not limited to, Flyers, calendars, Promotional freebies. "We", "Us" or "Our" means eyetina.com. 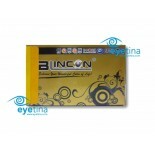 "Website" means the websites located at www.eyetina.com or any subsequent URL which may replace them. 3.1 These Terms and Conditions shall apply to all Orders and Purchases. 3.2 The advertisement of Goods or Services on the Website or in our publications constitutes an "invitation to treat" and your Order constitutes a contractual offer. There will be no contract between you and Us unless and until We accept your Order in accordance with the procedures detailed below in Clauses 4, 5, 6 or 7 (as appropriate). 3.3 We will not file a copy of these Terms and Conditions specifically in relation to your Purchase. We may update the version of these Terms and Conditions on the Website from time to time, and We do not guarantee that the version you have agreed to will remain accessible. We therefore recommend that you download, print and retain a copy of these Terms and Conditions for your records. 3.4 The only language in which We provide these Terms and Conditions is English. 4.1.5 Once the Confirmatory Email has been sent to you, we will deliver the Goods/Services in accordance with Clause 13. 4.2.6 Gift Vouchers have an expiry date, usually twelve (12) months from the date of Purchase, and this will be stated on the back of the Gift Voucher. 4.2.7 International Customer are advice to check their respective import laws regarding tax and import duty. Eyetina.com will not be held responsible for goods held by respective country's custom. 5.1.3 select the product and delivery method and click "add to cart". 5.1.5 complete your details and those of the recipient of the products (if different from you) and the free gift (if appropriate). Our policy, unless indicated otherwise, is that any free gift will be sent to the recipient of the products. You will then be asked to proceed to the secure third party payment gateway. 5.1.7 Once the Confirmatory Email has been sent to you, We will deliver your Subscription in accordance with Clause 13. 5.2 If you are unable to provide Us with the Reference Code of the Gift Voucher in accordance with Clause 5.1.5, or where the Reference Code you do provide to Us has already been activated, We are not obliged to accept your Gift Voucher. 5.3 Where you are entitled to a free gift in accordance with Clause 5.1.3 we reserve the right to substitute the one advertised for one of equal or greater value, at our sole discretion. 8.1 Where Goods or Services may only be purchased by persons of a certain age you will be asked when placing an Order to declare that you are of the appropriate legal age to purchase the Goods or Services. By submitting an Order, you are confirming to Us that you are of an appropriate legal age to purchase the Goods or Services requested. 8.2 If We discover or are of the opinion (as to which We shall have sole discretion) that you are not legally entitled to order certain Goods or Services, We shall be entitled to cancel the Order immediately, without notice. 9.1 The price of the Goods and Services shall be that stipulated on the Website or as otherwise advised by Us to you via an advertisement or when making a Purchase by telephone or post. The price is not inclusive of VAT and, with regard to products, delivery charges also ("Price"). The Website contains a large number of Goods and Services and it is always possible that some of the Prices on the Website and/or on Our advertisements may be incorrect. We will verify prices as part of our sale procedures so that the correct Price will be stated when you pay for the Goods and/or Services. We shall also confirm the Price to you when you are submitting your Order using the telephone or by post. 9.2 When making a Purchase of Goods or Services other than Subscriptions, you may have to pay a delivery charge in addition to the Price. We will inform you of this during the ordering process and before the Contract between you and Us is concluded. 9.3 Subject to Clause 9.4, payment must be made prior to your Order being accepted and a Contract being formed. 9.4 You will have different payment options available to you when purchasing a Subscription and these will be brought to your attention during the ordering process and before the Contract between you and Us is concluded. 9.5 When making a Purchase via our Website or by telephone, payment must be made in Sterling either by credit or debit card. Direct Debit payments can be accepted from UK bank accounts only. Payment for Purchases made by post can be made by credit or debit card or cheque in Sterling, unless otherwise intimated to you; there are limited options available to pay for some Subscriptions by cheque in a foreign currency. All card transactions are processed through a secure payment gateway. All credit/debit card Purchases are subject to validation checks and authorisation by the card issuer. If the issuer of your payment card refuses to or does not for any reason authorise payment to Us for a particular Purchase, We will not accept your Order. 11.1 We reserve the right to withdraw any Goods or Services from the Website at any time. 11.2 We shall not be liable to anyone for withdrawing any Goods or Services from the Website or for refusing to accept an Order. 11.3 We have a right to revise and amend these Terms and Conditions (including Price) without notice however any changes will not affect Contracts which have already been concluded in accordance with Clauses 4, 5, 6 or 7. 12.1 We cannot describe every detail of the Goods or Services on the Website and each description is therefore abbreviated and is correct at the time of its input. 12.2 We expressly exclude warranties, conditions, or terms whether implied by Statute, common law or otherwise to the fullest extent permitted by law. Any recommendation or suggestion relating to any of the Goods or Services made by us is given in good faith, but it is for You to satisfy yourself as to the suitability of the Goods for Your purposes. 12.3 You warrant and undertake to Us that: (a) you are legally capable of entering into binding contracts, and you have full authority, power and capacity to agree to these Terms and Conditions; (b) the information provided in your Order is accurate and complete; and (c) you will be able to accept delivery of the Goods and Services. 13.1 Unless We agree otherwise with you, Goods supplied within or outwith Malaysia will be delivered within 30 days of conclusion of the Contract. 13.2 Where you have purchased a product, unless We agree otherwise with you, the first delivery may take up to six (2) weeks to be delivered.n. 13.3 Subject to Clause 5.3, if a free gift is included in a product which you have purchased in accordance with Clause 5, we shall use our reasonable endeavours to deliver this free gift, under separate cover from the Goods forming the basis of the product and within twenty-eight (28) days of conclusion of the Contract. 13.4 We shall use our reasonable endeavours to meet any date agreed for delivery. Notwithstanding the foregoing, We shall not be liable for any losses, costs, damages or expenses incurred by You or any third party arising directly or indirectly out of any failure to meet any estimated delivery date. 13.5 Delivery of the Goods or Services (if appropriate) shall be made to the delivery address specified in the Order and You shall make all arrangements necessary to take delivery of the Goods or Services whenever they are tendered for delivery. 14.1 The Goods will be at your risk from the time of delivery. Ownership of the Goods will only pass to you upon the later of: (a) delivery of the Goods; and (b) receipt by Us of full payment of all sums due in respect of the Goods (including delivery charges). 14.2 We will be entitled to recover payment for the Goods where the Goods have been delivered to you even where ownership has not passed to you. 15.1 We shall not be liable to you for any indirect or consequential losses whatsoever or howsoever arising. 15.2 Subject to Clause 16.3, our entire and aggregate liability to you shall in no circumstances exceed the Price of the Purchase giving rise to the claim. 15.3 Nothing in these Terms and Conditions shall exclude or limit your or Our liability for death or personal injury caused by negligence or breach of statutory duty. No failures to exercise and/or delay by Us (whether express or implied) in enforcing any of its rights under this Contract shall operate as a waiver thereof. A waiver by Us of any breach of the Terms and Conditions shall not prevent the subsequent enforcement of that provision and shall not be deemed to be a waiver of any subsequent breach of that or any other provision. 17.1 These Terms and Conditions, postal order forms, recorded telephone conversations at the time of submitting the Order and any other document referred to herein constitute the entire and only agreement between the parties in relation to its subject matter and replaces and extinguishes all prior or simultaneous agreements, undertakings, arrangements, understanding or statements of any nature made by the parties or any of them whether oral or written (and, if written, whether or not in draft form) with respect to such subject matter. We shall not be liable for any delay or failure to perform any of Our obligations if the delay or failure results from events or circumstances outside Our reasonable control, including but not limited to acts of God, strikes, lock outs, accidents, war, fire, terrorism, breakdown of plant or machinery or shortage or unavailability of raw materials from a natural source of supply, telecommunications failure, epidemic, perils of the sea or air, flood, drought, explosion, sabotage, accident, embargo, riot, civil commotion or civil authority, including acts of local government and parliamentary authority; disputes of whatever nature and for whatever cause arising including but without prejudice to the generality of the foregoing, work to rule, overtime bar, strikes and walkouts. We shall endeavour to notify you as soon as possible should any such events or circumstances occur. You are not allowed to assign, novate, delegate or sub-contract any of your rights and obligations under these Terms and Conditions. We may assign, novate, delegate or sub-contract any of our rights and obligations under these Terms and Conditions at Our discretion. Nothing in these Terms and Conditions affect your rights at law (including your right to receive a refund in respect of any defective Goods We sell to you). In the event of a query or complaint about the Website or Us, please email ask@eyetina.com or contact Us at the addresses noted below. We offer the LOWEST prices for Contact Lens. We carry varieties of brands including Cibavision, Bausch & Lomb, Coopervision, Blincon, Air Optix, Acuvue, ColourVue and many more! We are an online contact lens shop with good selection of prescriptive soft lenses, monthly lenses, daily lenses, colored leness, toric lenses & multifocal lenses. We are priced low and we shipped anywhere in the world.